You can also be informed about planned maintenance and confirmed disruptions. Contact your iDEAL contracting party to register for this service. You can use the availability information to inform your customer about any occurring disruptions with their bank. That way you prevent your customer experiencing any problems during the iDEAL payment. Additionally you can offer them to pay via another bank for example. 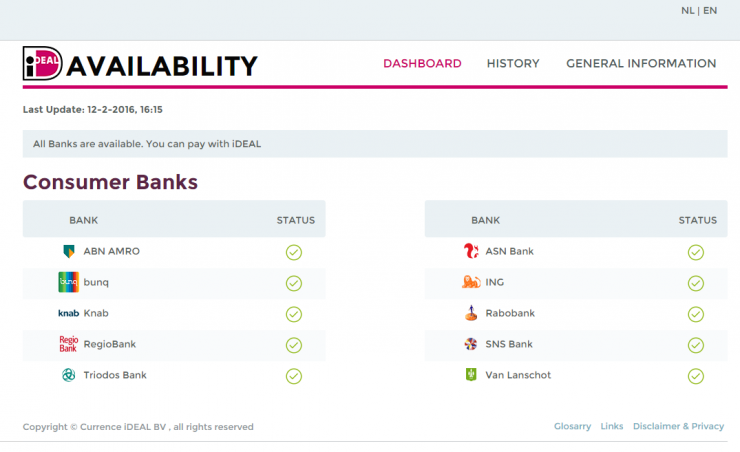 Do you want your clients to pay with iDEAL even though iDEAL is unavailable? In that case, you might want to send an iDEAL Payment link. For more information about the iDEAL Payment link, click here.